There have been some reports in the Western media on Ali Karimi, dubbed 'Maradona of Asia', having been sacked from his club, Steel Azin, for refusing to fast during a football match. There is more to all this however than just the fasting issue during the month of Ramadan. Ali Karimi's saga is part of a wider story which is going on in Iran right now, the divide between those sportsmen and artists who are standing by the people against the coup administration and those sycophants who are going out of their way to endear themselves to the ruling oligarchy. Ali Karimi was one of the six Iranian national football team players who wore green armbands in solidarity with the Iranian protesters during the world cup qualifying match with South Korea in Seoul. Apart from his sporting heroics, Karimi is a true people's champion. 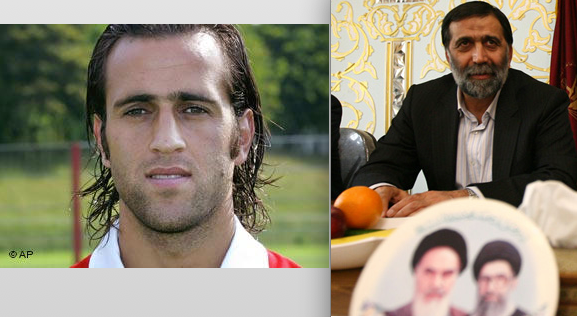 Former Iranian national football team player, Hamid Steeli who scored with the unforgettable header against the US in the 1998 world cup, describes Karimi as a truly genuine human being who, unknown to most people looks after several orphan kids, he is frank and speaks fearlessly for what is right, I have never known someone so frank, especially that his candid remarks are often made in support of others. Karimi's team mate at Steel Azin club, Gholami in a truly sporting spirit has also stood up for Ali Karimi and said 'I came to this club because of Karimi, we will all do everything to reinstate him'. Gholami also confirmed national team player, Mehrzad Madanchi's statements that everyone in the club that day had lunch in a restaurant. Madanchi said 'We are all Muslims but we can not fast during football matches, it is impossible. There were water bottles by the side of the pitch for the players but I never saw Karimi drink one during that football match'. 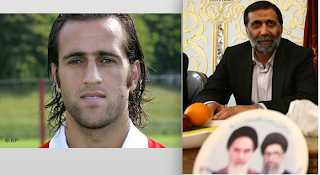 Babak Massumi, the former captain of Iran's indoor football team told IPNA news, "People must know that when I was diagnosed with cancer and the medics had lost all hope, it was Ali Karimi's generosity that made sure my medical bills were paid. He even paid for me to be upgraded to a private room and yet he never told a soul about this'. Within hours of Karimi's sacking, thousands joined a facebook page set up in his support (حمایت از علی کریمی). Yesterday, even pro-Ahmadinejad sites admitted that during Steel Azin's match without Ali Karimi, the crowds continuously chanted in support of Ali Karimi. 'I am Mostafa Ajorloo, a revolutionary guard, and I have faith in all religious values, after all, our Islamic revolution, as described by the Supreme Leader and the late Imam, as being all about observing our religious values and nothing else, and I am not here just for football, I am here for my religious values' - Enough said I think. Well there you have it... The two faces of Iran. Karimi: Compassionate, caring, humble and rational. And then of course Khamanei: The old buzzard vulture who likes nothing more than to have people dressed all in black clucking like thoughtless chickens at his feet! The face off couldn't be more stark could it? The objective free thinking of the 21st Century verses the 14th Century tyrannical ruling of Vlad the inpaler! potkin you should get on the case and do a post about the IRI connection with the Ground Zero Mosque ... specifically through Larijani and Mahallati brothers (Alavi foundation)its breaking now and you can put alot of context on who the Mahallati brothers are and the role of the Pasdaran in this project. Look at HP where I have commented about this on the posts about Rauf. Who is Threatening the 'National Security'?